How exactly do you want be happier? What would it feel like and look like if you were happier? What are you able and willing to do to find this happiness? How do you define “better job?” Does that mean making more money, pursuing a career that you are passionate about, or going back to school? Likewise, how do you define being a “better partner,” being more attentive, helping around the house, expressing physical and/or verbal affection, increasing frequency of intimacy, etc.? If you cannot answer these types of specifying questions, it will be difficult to define an attainable goal. Defeating Perfectionism: Having defined the goal, what obstacles can you anticipate? One guaranteed obstacle to overcoming procrastination is giving into perfectionism. Most envision perfectionists as people on the go, constantly fussing over details to make their efforts seem or feel flawless. There is a different type of perfectionist, though. This perfectionist is the ultimate procrastinator because they set unattainable conditions for a successful effort, and in doing so, convince themselves that there is no point in trying if the outcome is not guaranteed to be anything less than perfect. We talk ourselves out of taking chances all of the time by giving into this type of perfectionism. Develop a Plan: With your goals and potential obstacles identified and defined, now comes the planning. Begin by brainstorming ideas. Get them all down on paper. Most of these ideas will be lousy, but you only need a handful to start to put together a workable plan. Take the best ideas and apply them to a structured plan. I recommend the SMART Recovery Change Plan as an extremely useful tool for setting measurable goals. Enhance Motivation: With your plan in hand, you might still be tempted to fall into old patterns of procrastination. One of the best tools for building motivation is the Cost Benefit Analysis. It is important that you complete the CBA, rather than just think about it. You may be surprised by the results. Also, resist temptation to skip this step because the benefits and costs are self-evident. Objectively, this may be true; however, you would not be engaging in procrastination if there was not at least some benefit to it, even if it is short term and self sabotaging. Accountability and Follow Through: Making changes to overcome procrastination is extremely difficult, so it is essential to make accountability to self and others part of your Change Plan. To whom can you hold yourself accountable and how? How can you plan to overcome obstacles and not fall back into self-defeating patterns of procrastination? Do not allow a lapse to become a full blown relapse. A failing does not mean you are a failure. You are a fallible human being and your chances of successfully overcoming procrastination significantly increase through your unconditional acceptance of yourself. Use these steps to start the process, and realize that often the greatest obstacle to our progress is ourselves. 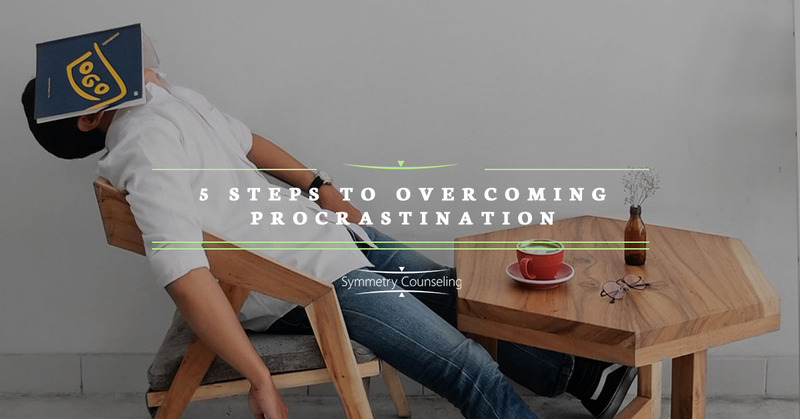 For professional help in overcoming procrastination, contact Symmetry Counseling Chicago for a consultation with our behavior change specialists.